The Messy Owl reviewed Take Me Tomorrow, stating, “A thrilling and entangling plot, full of suspense and action.” Read the entire review here or check out my latest novel by clicking here. As I near the release date of Death Before Daylight, I remember more topics that I can talk about due to the tasks I must complete beforehand. Writing the back blurb is one of these tasks. Oh, yes. The dreaded back blurb. Everyone knows about the summary of text on the back of the book that convinces readers, “Yes. You want this book.” The scariest part relies on the fact that the summary is exactly that – something that could make it or break it for a reader. So, I’m going to share how I write the back blurb by using Minutes Before Sunset as an example. First, I want to clarify that this is how I write one, and it may not be a method everyone should use. It also might come across as more complicated than it actually is, but that’s because I am breaking it down into five steps, even though – in reality – it feels like one when I’m writing the back blurb. I hope it helps those who are struggling with writing one! Oh, how painful this is. (Just kidding.) This is where I write whatever I want to. I explain the novel for as long as I like, and when I’m done, I slowly start to cut smaller parts out until I get it down to one page. Set aside until step 3. 5. Edit. Get opinions. Edit again. But decide on it. It’s over! You have your back blurb, and you’re ready to share it with the world. The only other thing I would mention is this: for series, I would suggest remaining consistent. Seconds Before Sunrise has the same parts that Minutes Before Sunset does – the slogan, the quote, the summary, and the review quote. Death Before Daylight will as well…which reminds me. 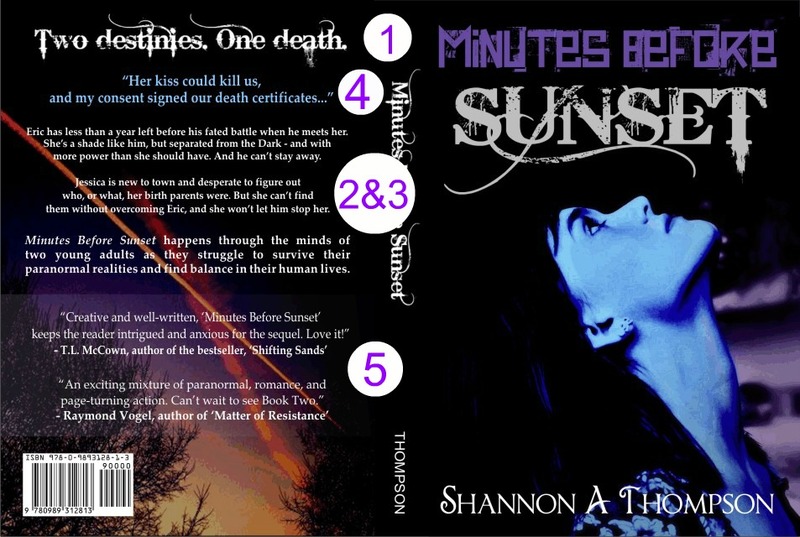 If you want an ARC of Death Before Daylight for review, please email me at shannonathompson@aol.com. I will share your review right here and on my other websites as well! And it should not be too long. Pithy and concise should do it. Great advice. Always felt like I was terrible at these things, especially when it involved a query letter. Just so much that the author knows about the book that it’s hard to decide what’s the important parts. I love this approach. Interestingly, I also tend to start with a synopsis and the two or three sentences will be the start. The Story in a Nutshell is what I usually call it, right there at the start of the synopsis. Thanks for sharing your approach, too! I think it helps other writers try something new, especially if they are struggling to write one.